Helen, I was laughing so much at the beginning of this post! What a lovely flavour combination....(I'm still trying to get mine right!). Glad they were enjoyed by all! Very funny. Reminded me of a time when I was transporting some macarons from Melbourne to Brisbane. I think I ended up with them on my lap in the plane! Not sure if all the different flavours were talking to each though??!! :) Love the painting on the shells. Have seen that a few times and definitely want to give that a go. Worried about how much liquid to really paint on - concerned I'd make the shell soggy????? What a great looking macarons Helen! No wonder they were so impatient to get to their destination, so they could show off their beautiful coffee streak. Have yet to find chicory here in the UK, but I'll definitely pick some up on my next trip to Belgium. I would have never thought to use chicory in this way even if I remember old tale of war times when it was used as a surrogate of coffee (that was impossible to find in those hard times). You always are a source of great ideas (and the photos are wonderful as well). LOVE the macaron dialogue !! Thank you for sharing their voice with us, such fun ! But of course, macarons have feelings too - I'll have to listen more closely next time I get baking! ;) Also love that painted coffee streak on the macaron shells, just beautiful. that is so beautiful! i love the brushing on the macarons. i was so worried they were going to confiscate them! hope your back feels better very soon. can't imagine how good these are. but I know they look beautiful! These macarons look so good. Helen, I tried making macrons few weeks ago, but was so disappointed. The whole thing was a big mess. Although whatever I baked, did vanish. I have a few questions as I do want to try making them again. 1. When you say powdered sugar - can I use confectioners sugar or should I pulse granulated sugar in the food processor? 2. Can almond be almond meal? Aren't Jaden, Todd and Diane lucky to have those yummy macarons? Gosh, how do you come up with such wonderful food! So lovely! Rice pudding is my ultimate comfort food as well! I've never tried it with macaroons though, will have to give that a go! That looks gorgeous. It's tempting too. As always, they look spectacular! Ooo, these look fabulous but all the ones that you make do! :) I was planning on doing a second batch, but well... it just got too busy. But these might just be the perfect flavour to try.. Lovely! ur macarons are simply gorgeous! Loved the macaron conversation Helen..LOL. saw it all happening as a film...cute! !I'm feeling quite brave this time, having read this post 3 times over. Am off to check the 'must read for first time macaron people'...& will plan to have egg whites in fridge for 3 days! I love the flavours on this batch.We get a nice Indian coffee with a chicory blend...aaaaahh, could chicory be calling to moi? Beautiful post!! Yum, I love chicory coffee with beignets...need to try them in macarons.And don't the macarons know the better they're squeezed together, the less they'll get into trouble? Helene - I just picked up my favorite little freebie publication called Skirt! while on my lunch hour here in Charlotte and saw your blog mentioned. Way to go!!! Helen, you are a genius! 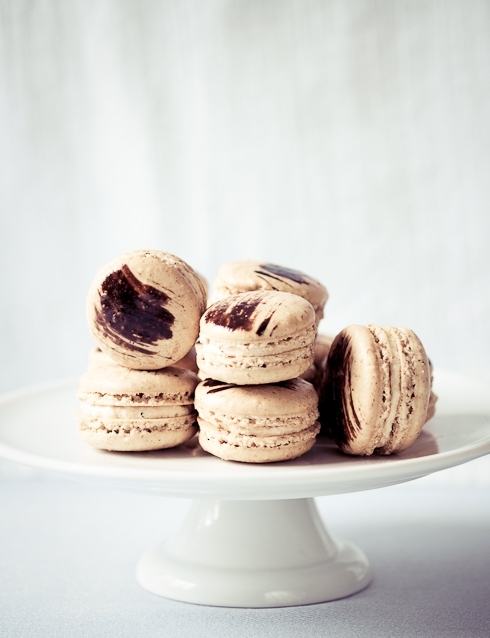 OMG, I heart macarons just by looking at your photos! I sound like a broken record, but MAN are they beautiful! I love that you used a paintbrush. Mini works of art, they are. So is there a reason to not use cream of tartar to stabilize the meringue? Does this change the texture of the macaron? Just curious. 2- the goal is not to keep the meringue airy or resistant but to work it into the batter (macaronage) with the almonds and powdered sugar. As always, love your food, pics, and voice. The paint is a perfect touch. Inspirational! The flavor combination sounds scrumptious! Too funny - I made something very like this a couple months back. Just make chicory shells (with chicory essence) and sandwiched them with your chocolate mousse cake - soo good! I love the painted swipe on top. I love your blog. your recipies and of course your macarons! I haven´t done any macarons yet, I´m looking foward to find almond flour since with my food processor I can´t obtain a good texture. I would like you to post all the secrets of macarons in one publication since I´m not living in USA and I can´t purchase the "Desserts mag". But I answered Jen so I hope you can get some feedback from the answer I gave her. I am always amazed when you do macarons and I'll enver get tired of the flavors you come up with! Erika: Desserts Mag is a free online magazine so no need to purchase: just click and print! Ah!! My flavour:). Poor security guy - smelled them, felt them but unlucky fellow didn't get any! I adore that little bucket of yours! Gotta love the cookie monsters we got around, but who can blame him right? I am cracking up! And the macarons... well, delicious as chicory is one of my favorite childhood smells. Reminds me of my grandmother's coffee! I am definitely going to try these out. Seem like perfect little dessert cookies. Very very beautiful blog,recepes and sooo gooood pictures....congrats.. BEAUTIFUL!!!! I adore the flavor combo!!! Thanks for the laugh! I am always amazed at the beautiful creations that come out of your kitchen. Beautiful! I love the "paint." I wonder if it could be used for some other kind of cookie? Laura: yes, it could work on other cookies. You can try to paint with food coloring also. Like Easter eggs I guess! I have to say, I didn't think much of macarons until I went to Paris. I just found them way too sweet and not much else. Especially the ones that were filled with jam of some sort. And then came Paris. I had the best macarons ever at a small pastry shop: salted butter caramel and cassis. Not overly sweet, not just a mere butter cream. Even the shells tasted very much like caramel and blackcurrants. They must be putting something in the shells. PLEASE tell me what the secret is. I have to know. These coffee macarons will be perfect for me. Do they have a strong coffee taste? I'm making a batch of 100 macarons for a friend's wedding. These ones might be just perfect. Also would you happen to have a good lemon curd filling recipe for macarons? I have to make brown and yellow macarons in keeping with the theme. great post. I really do need to try a macaron. After all that "are we there yet?" and then they get eaten!! ;) You always make treats such a visual adventure for those of us unfortunate enough to not be in your presence. And you're always so sweet to bake for blog/friends AND another batch for B. He's a lucky man (birthday boyeeeeeeee). It's okay, the older you get, the longer you celebrate the birthday, no? Hahha, very cute. I love macarons!!! good thing they got threw! Ah, the things food bloggers do for their food blogging buddies. I love it! Cherie: there is no real secret to the shell flavours: you can add a lot to the batter itself as long as it is not liquid: zest, powders (powdered dried fruits), etc... These were strong but you can adjust the strenth of the coffe to your liking. Yum. Those were hardy macarons to be able to handle all of that travelling. I'd be afraid everything would be crushed in my suitcase. Thank you - it did answer my question. Thank you so much for these recipes! You've inspired me to make some last night. Actually I've been dying to make some but have been too scared, but I tried it. It definatly didn't come out to look like anything like yours, but the taste and texture were as I remembered. I will definatly try again! Thank you again! your pictures are always so professional and make me want to make some myself! 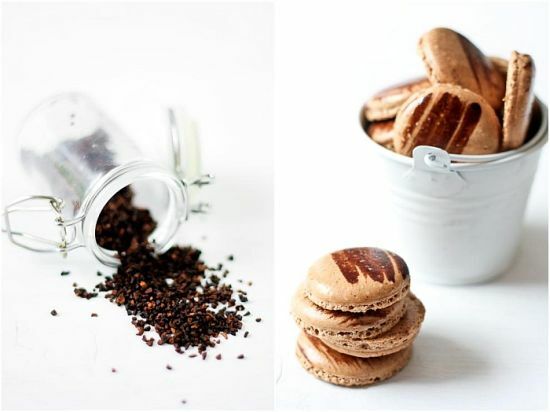 the coffee and chicory must be nice in a macaron together as well! Your macarons always look fantastic!!! I tried some the other day, but they had an air pocket.. :( maybe next time..
Hello! 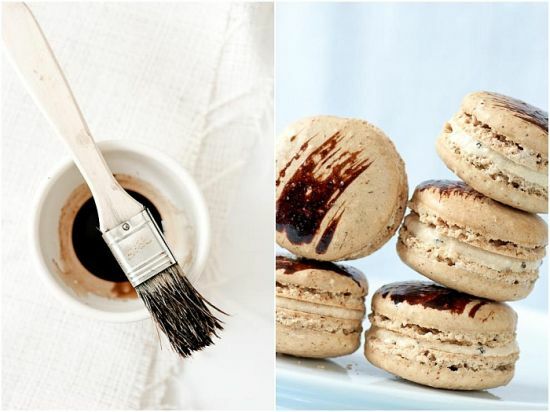 These macarons look amazing... the coffee brush strokes is such a clever idea. Will definitely try this out! Did you find any good macarons while you were in Asheville by any chance?? I'm getting married there soon and am just dying for a table full of macarons for my guests. 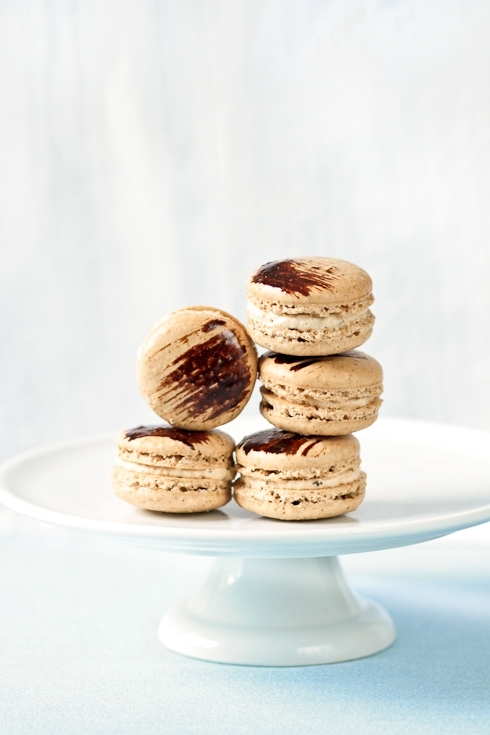 How long can macarons last without being in the fridge? Will it be ok if I send my husband off with some for 12hrs in the car for our dear friends in DC. would you like tell me, why the base of my macaron is empty? Hey, I am going to try out this recipe for my friends bridal shower, I didn't seem to notice how many Macarons this recipe will make? Can you let me know so I can figure out how many times I need to make it. I want to make this recipe for my friends bridal shower. I didn't seem to notice how many Macarons this recipe will yield. Can you let me know so I can adjust accordingly. Thank you!! !